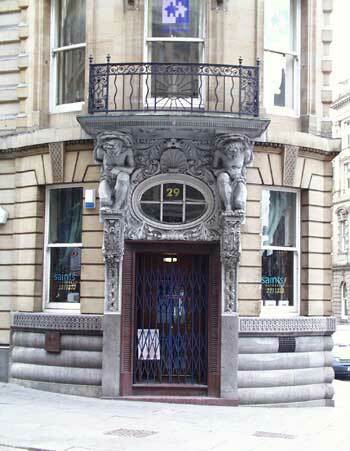 The entrance to number 29 Collingwood Street. Another Oliver, Leeson and Wood grand finance building using the familiar features of heavy cornice, giant Corinthian pilasters, pedimented windows and heroic figures supporting the central canopy. The Westgate Road elevation is topped by a huge golden sunburst and the wrought-iron balconies carry smaller sun motifs. In this lower stretch of Westgate Road, William Bell, one of the Royal Academy's first gold medalists, taught the art of drawing.